CSB FORM SERVER IS NOW OFFLINE AND WILL NOT RETURN! YOU MUST REPLACE YOUR CSB FORMS! READ THIS THREAD ON THE FORUM ABOUT FORM ALTERNATIVES! The rest of the page is under revision...field codes are correct but there is no instruction how to process the forms! This page will show you how to CUSTOMIZE the look of a form via email from your website. Have customer print a form and fax/mail it in. Plain flat page. KW's website has a terrific example. Visitor prints form and completes offline with a pen/pencil/typewriter. Just build a nice table and give instruction to print and fax. Step by Step instructions (from the CSB4 User Guide) how to create a form and adjust it. Modify your CSB or Trellix form! Use another form server to process your current CSB form. Make a basic form with the built-in wizard. Publish. Copy the code generated by CSB, then insert it into your CSB web page using INSERT >HTML and change the form processing information. Tutorial for this shortly. Use an Iframe. Fit the form and the response into a tight space. Info here. 1 special feature added to a plain, unformatted form disable enter key. Two samples. Sample run through CutnPaste server to allow for unlimited fields and other options. Design your form with this 1-2-3 method, then seek a different way to PROCESS the form. Read more here. The basic form code created with CSB form wizard has been split into 3 sections and redesigned. 1) Start of form (definition of fields, server and response page statement). 2) End the form with the print/submit/reset buttons to send input in an email to you. 3) Between 1 and 2, build a table in CSB, then put the form fields into it. You can convert an existing form or use CSB to create the form fields for you then place the code into a customized table so they will match your site. Or just use the sample codes provided below in your table. Modify red items to suit. Add fields to value list as you build the form. Modify the email address to use the HTML equivalent for the @ symbol. Placement: Create a table between the start code and the end code (buttons). Click on a cell where you want an input field. Choose how you want to put the HTML code into the table. PASSTHRU technique (like Name and Address) using <| before and |> after the code. This puts the code directly into the table so you can see it in the design window. If using this method, it must be ALONE on the line/cell and use the passthru codes. If inserting the code into Insert> HTML (webgem) DO NOT use the <| |>. In smaller cells, I find this way works better than passthru technique. Right click it to "save as" to use for HTML your placeholder. To capture the code, press Select All then COPY (Ctrl C) the contents. Paste (Ctrl V) code into an insert > html (webgem) in your webpage. Modify the code to suit your form. BOLD BLACK: This is the NAME OF THE FIELD and must match the name listed in the VALUE LIST. Bold Black: the name of the input field. Blue: this cols number tells how WIDE the input area will be. Red: this row number tells how many characters can be input. Red: this row number tells how TALL the input area will be. Gold: set to number of options. I have 4 options. <option value="Hello! ">Just want to say HELLO! COMBINE YOUR ANSWER TO AVOID CALCULATIONS IN YOUR FORM! All choices for this field must be in the same cell to avoid errors. Don't use check boxes if possible. CONVERT AN EXISTING FORM or use CSB to create the form fields for you! Grab the form field codes out of the Form Fields area of CSB created code. Place each <input> code into its own webgem (Insert > HTML) in a table between the starting and ending codes as shown. Send me a comment from the form if you like! The forms on this page were first drafts/samples for this site. This black form is the final form in use by a photograher. Richard has used the same concept of inserting html code into a table (my step 3) to create a printable form. Just leave out the top and bottom code that sends the form via email! Info here. Want to use another company (third party) to handle the processing of the form? Often these allow more fields and other options. Fine. Replace code #1 to send the form to the proper place (get the code from your form processor) and keep the rest intact unless you need to add something for required field. CutnPaste uses their CGI bin, free service - sign up, describe fields on thier site. Here's an active form for a photographer. The samples on this page were first drafts for his form. 123 method used to make the form with CutnPaste server information in the 1st start the form code: red altered. 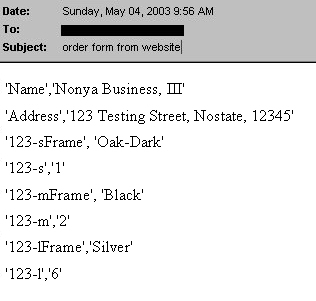 My personal contact form is seen through an iFrame. An iFrame (a window cut into your web page) is great to limit the size of the form and response page! 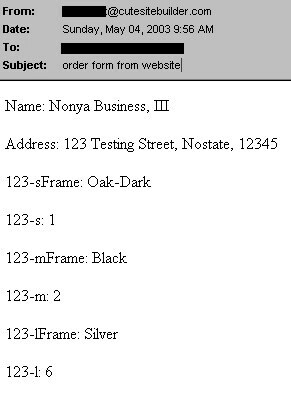 Your form will blend on the page and better yet, the personal response will show up inside the iFrame on the contact page letting your visitors still have access to your links! Read more about iFrames here.